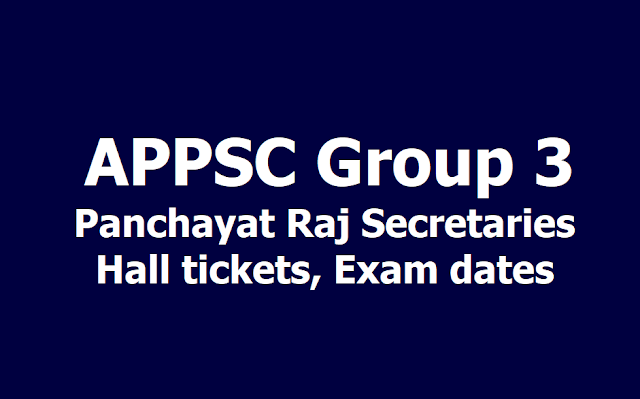 APPSC Panchayat Raj Secretaries Hall tickets, Exam date 2019: APPSC issued the Panchayat Raj Secretary posts Recruitment 2019 notification and applications were invited through online mode from qualified candidates to the post of Panchayat Raj Secretaries in Panchayat Raj Department in the State of Andhra Pradesh. APPSC screening test is scheduled to be held on April 21, 2019. Andhra Pradesh Public Service Commission (APPSC) Group 3 hall ticket for the recruitment of Panchayat Secretary is expected to release on April 15, 2019. The candidates who will be appearing for the examination can download the Hall tickets from the official website psc.ap.gov.in. The exam is scheduled to be held on April 21, 2019. And the candidates who cleared the screening test will have to appear for the main exam on August 2, 2019. First visit the official website psc.ap.gov.in. Click on the given link. (Download Hall ticket for APPSC Panchayat Secretary Screening Test Hall Ticket 2019). A new page will be displayed, here enter candidate ID/reference ID and date of birth and click on the 'Submit' option to proceed. Your Hall tickets will be displayed on the screen. Check all your details and take a print of your Hall ticket for future use. A total of 1051 vacancies have been announced by the Commission for recruitment to the post. Candidates who qualify the prelims will be eligible to apply for the main scheduled to be held on August 2. - The screening test for recruitment for the post of APPSC Panchayat Secretary will be held on April 21, 2019. -The main examinations for the APPSC Panchayat Secretary are scheduled to be conducted on August 2, 2019. The APPSC introduced the Screening test and Main Exam for Group 3 posts recruitment. The Screening test contains 150 questions. The Main exam having two papers. The first paper having General Studies and Mental ability(150 questions). Second paper having Rural Development and Problems in Rural Areas with special reference to Andhra Pradesh was done by the candidates in the examination hall(150 question). The APPSC covered about the situations and problems of the people who are living in the rural areas in paper-II. In this exam each question carries one mark. The Commission conducts Screening test in Off - Line mode in case applicants exceed 25,000 in number and main examination in On-Line mode for candidates selected in screening test. The date of screening test will be communicated through Commission’s Website. The Main Examination is likely to be held On-Line through computer based test. There would be objective type questions which are to be answered on computer system. WRITTEN EXAMINATION would be Objective Types in Degree Standard. Selection of candidates through Screening test and Main Exam. Appointment to the Panchayat Secretary posts will be made by examination (objective type) by Online/ OMR based. In case screening test is conducted as referred above, based on the Merit in screening test, candidates will be picked up in the ratio of 50 per one notified post for the main examination in order of General Merit. The final selection of candidates for appointment to the posts shall be based on the merit in the computer based main Examination, to be held as per the scheme of examination. Screening Test: The Screening Test for filling up Panchayat Secretary (Grade-IV) posts under Group-III Services is scheduled from 10.00 AM to 12.30 AM in 13 Districts of Andhra Pradesh. The Commission has made all the necessary arrangements for the conduct of examination. The candidates will be allowed into the examination hall from 09.00 AM to 09.45 AM, on due verification of Hall Ticket and Original ID (Passport, Pan Card, Voter ID, Aadhar Card, Govt. Employee ID or Driving Licence). Extra time as permitted would be given to eligible disabled candidates. Candidate specific OMR is prescribed to minimize errors by the candidates. This examination has negative marking system with 1/3rd mark deducted for each wrong answer. A Helpline and Command Centre are available at the following numbers for benefit of candidates and Invigilators. Main Examination: The Main Examination of Panchayat Secretary would be held at 13 Centres. Candidates are advised to download the hall tickets from today and check their centres beforehand so that on the day of examination confusion would be avoided. Cell phones, calculators and any other electronic gadgets hand bags and writing pads would not be allowed in the centre. The candidates shall make their own arrangements outside the centre to keep their belongings. Candidates awaiting Hall tickets for the APPSC Group 3 service exam can expect it to be released. The recent official update given by the Commission in this regard is that the hall tickets for the above mentioned exam will be available. Candidates can download the hall ticket at the official website of the Commission at psc.ap.gov.in. APPSC has informed that Hall Tickets for Screening Test (Offline) to the post of Panchayat Secretary (Notification No.13/2018) which is scheduled to be held on 21/04/2019 are hosted in the Commission's Website i.e., https://psc.ap.gov.in, from 15/04/2019 for down loading. Step 2: See the link to download APPSC Panchayat Secretary Hall tickets 2019 . Step 5: Download the Hall tickets. Step 6: Take a print out of the call letter to the venue of Exam. is it possible to apply telangana students to this notification ?